if you read this blog (and thanx if you do! 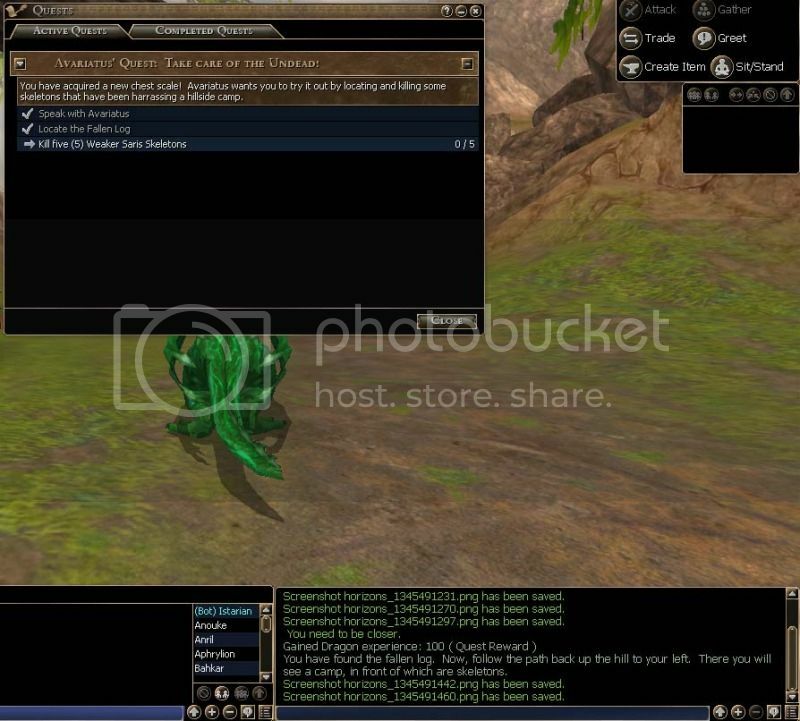 ), then you are very familiar with the istaria wiki. it has been a bit outdated, but dear racktor has taken up the call to make it a more complete reference! it is, of course, an ongoing mission, and rack can't do it alone, so i want to thank the great dragon and all the other players who help! 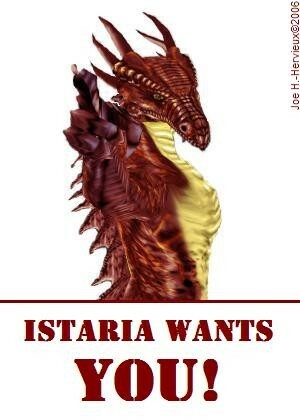 the wiki should be the #1 source for material regarding istaria! here is the thread from teh forums, in case you want to follow along. once again, all thanx to racktor and to the small-in-number but ginormous-in-passion players of the mostest awesome mmo around! you guys totally rule! with all the running around and crafting and fighting, i always forget about the important stuff like training points and hotkeying new abilities. i have already covered training points and how to use them, but i have neglected abilities, which is just not right! 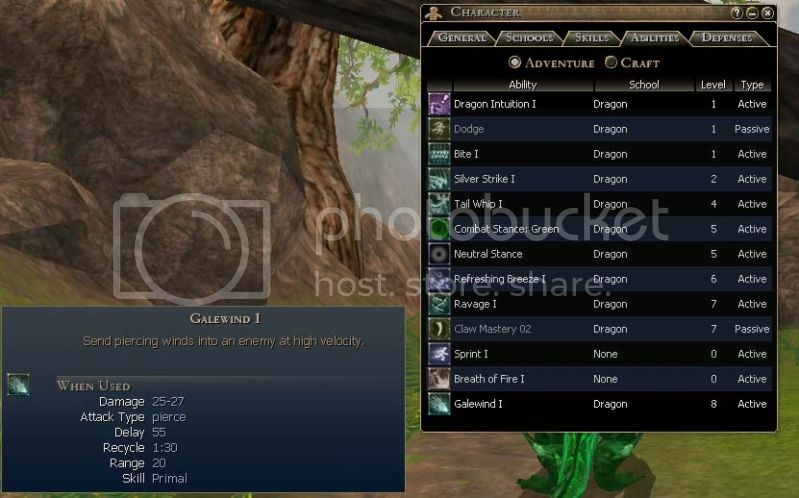 while looking on my character page for something else, i noticed that i had to allocate some training points. doing that reminded me that i should check my abilities, to see if i had gotten any new ones. which i had, indeed! every race and profession has particular abilities. some are masterable (meaning you are able to advance them thru quests, etc. [this particular line of blogs started with my desire to show you the location of all trainers, starting with the dragon trainers. soon as i get done with the starting dragon quests, i will bring in mourningwood, who can safely get to all the trainers. ]), some are of a set effectiveness. some are passive, some are active (meaning you have to invoke them). it is the active ones you have to hotkey for easy use. masterable skills can also be used when you switch skewls - for instance, as a level 100 warrior, velveeta can use, let's say, defensive style when in cleric skewl as well, because it is a masterable ability - once you have mastered it, you know it. 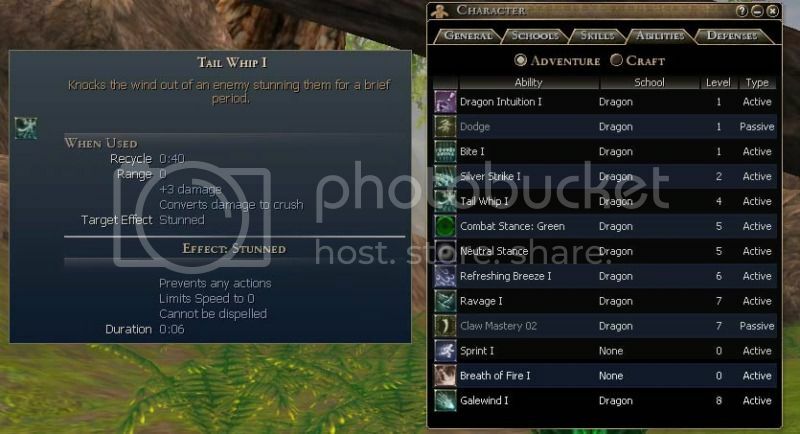 non masterable abilities are not available when you switch to another skewl, like power shot - an ability only available to crossbowmen, elemental archers, rangers and scouts. even switching from crossbowman to warrior (using the same weapons, armour, etc.) does not let the warrior skewl get access to power shot. 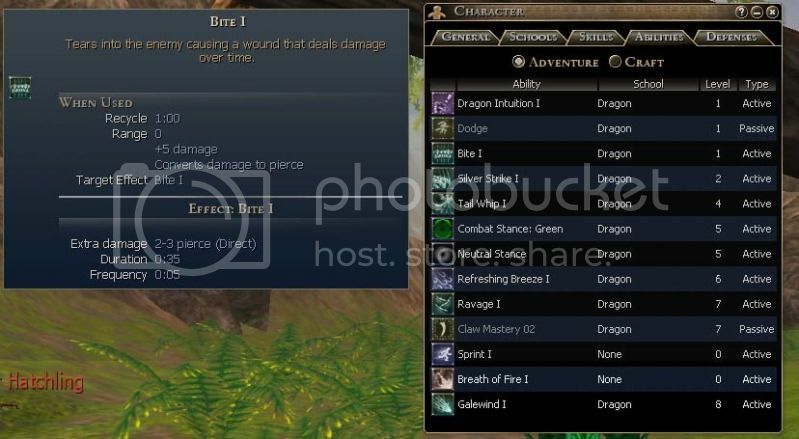 you already have some experience with abilities - after all the crafting, you are very familiar with dragon crafting abilities like mining, stoneworking and essence harvesting. so hotkeying your adventure abilities shouldn't be any prob! almost all active abilities have a recycle timer, the time it takes to regain the use of the ability. 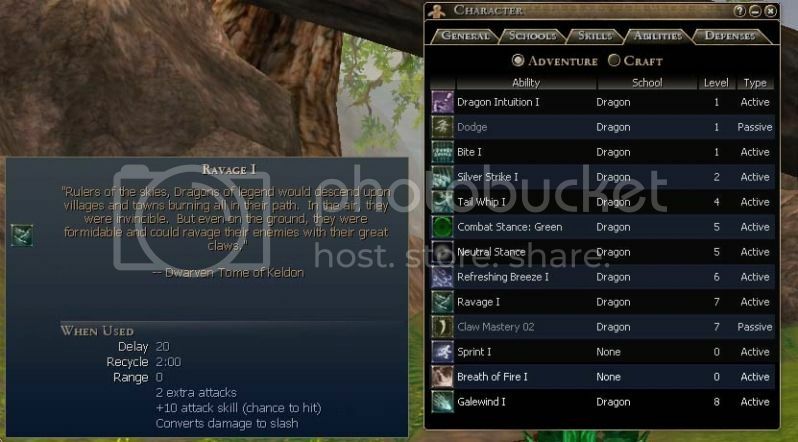 some adventure abilities auto recycle when you choose a new target. so, my advice is to not be the eternal noob i am, and try to remember to allocate your training points and hotkey your new abilities every level. 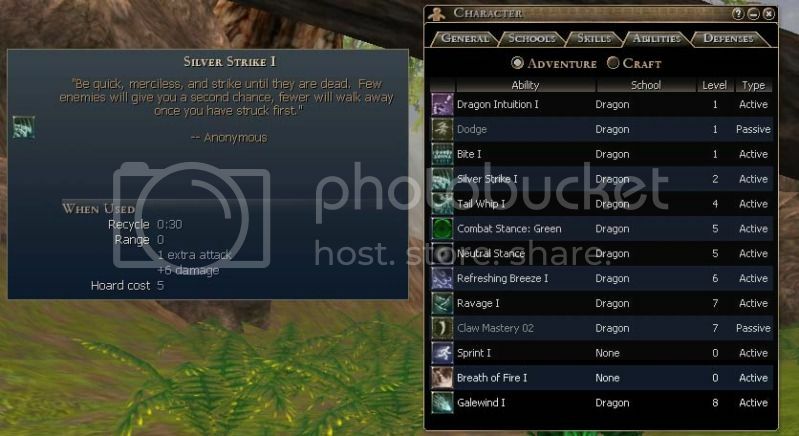 dragons eventually get reminded when you can't use the lower tier ability (crafting abilities in particular. 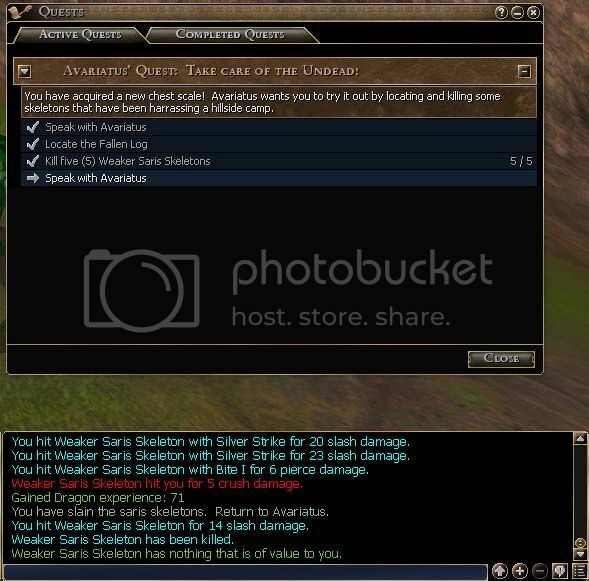 the hotkey will grey out and you will get the 'you don't have the proper ability or tool' message), but who needs to lose all that experience while you do the quest? now that that is out of the way, we can get back to the training quests! see you soon for more! temporarily free from crafting, you head to avariatus' cave to find out what the dragon adventurer wants you to hunt down. ooooo, sahweet! just in time for the holiday, you get to mess with some skellies!! checking your journal gives you directions that sound kinda familiar! you already know where the fallen log is, as you had to pass it to get to the higher level gruoks from an earlier quest. take the monster road out of town and head past the spiders. you will see the dead tree that has fallen overhead on the path, and your quest journal will update. conntinue under the fallen log and almost immediately on your left, you will see a path heading up an incline. at the top of the incline (just fyi - you can run thru the fallen log and explore on the other side of the cliff when you get a moment. istaria is full of little wonders, you just have to go find them!) 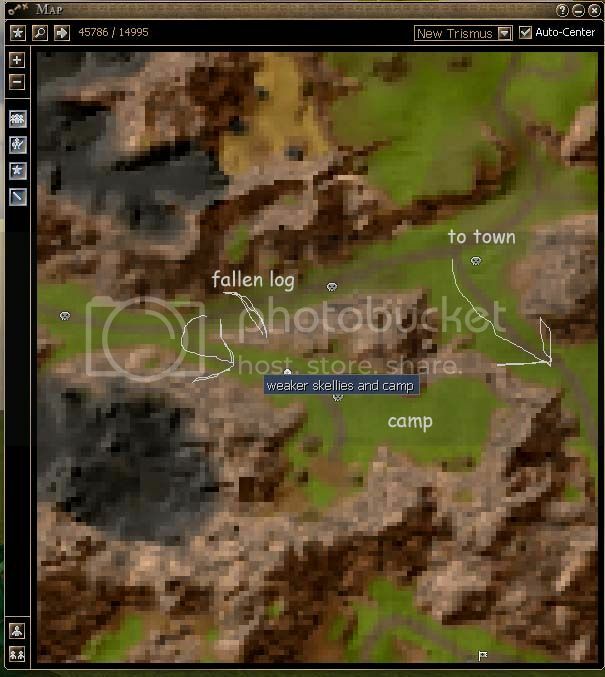 you will see the camp, surrounded by saris skellies. 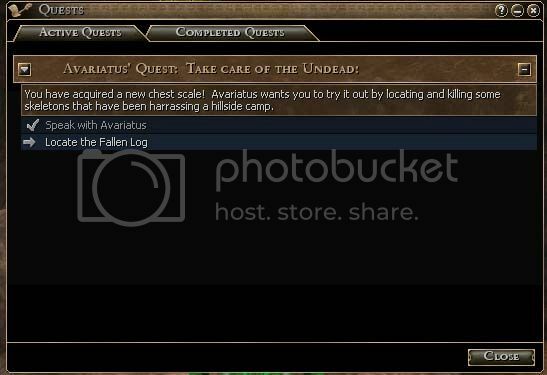 kill the 5 you need and return to avariatus. see you soon with more fun stuff! unfortunately, the rest of the speech i am unable to make out. i promise to be more careful in future! but speaking of new abilities, i have a great idea for my next post! check back in a day or two for something of important interest to all characters, not just dragons! now that you have a new weapon, baptized in battle, you need some new armor. kerian can help you with that! 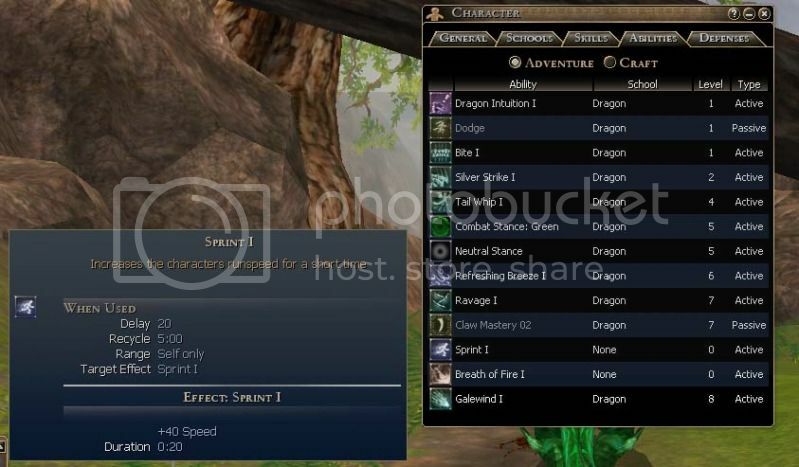 the dragon trainer gives you some background and a new scale form. 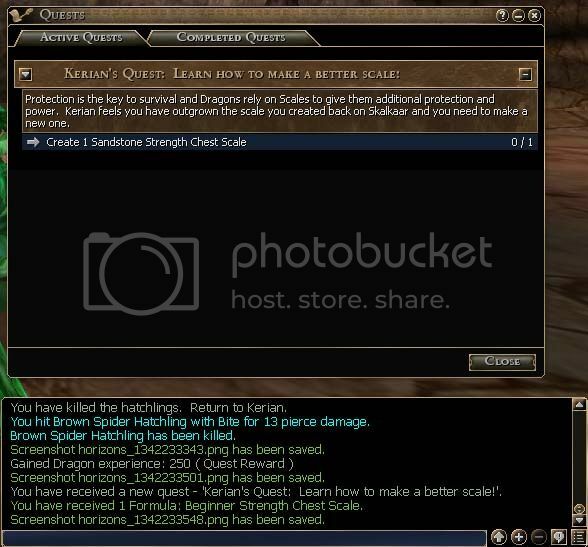 your quest journal show how simple and easy this quest should be - just create a sandstone strength scale. you already know the routine, or you should by now. 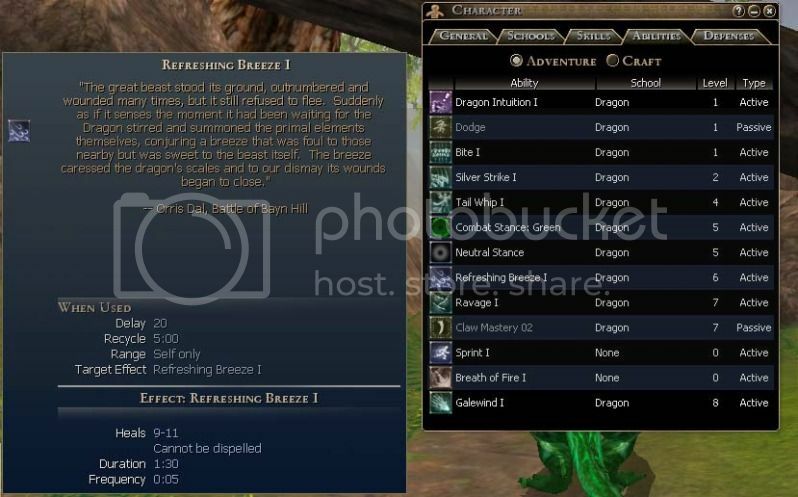 scribe the form, gather the needed resource(s), go to a scaleforge, click your scalecraft hotkey, make the scale. 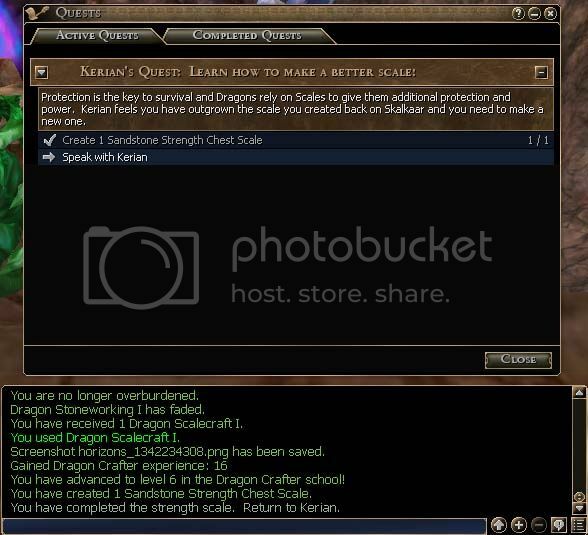 your journal will update and as kerian is only a couple steps away, you can easily get your 'good boy' word of encouragement! 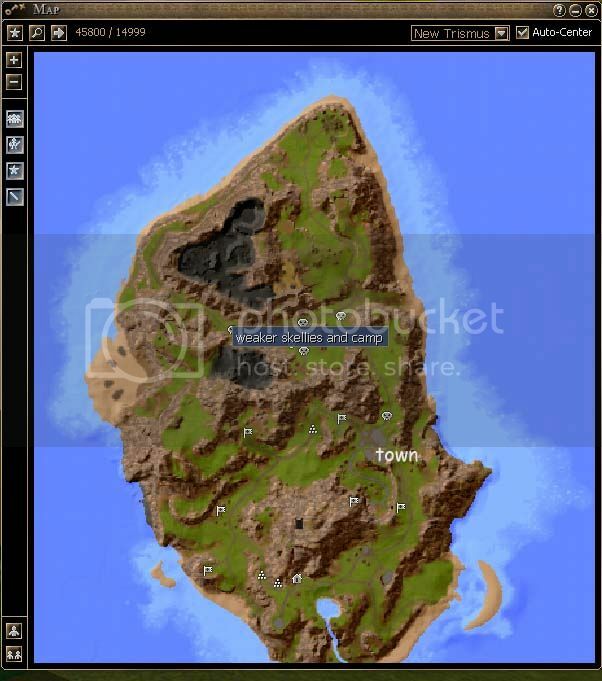 and, prolly just in time, let you know that the adventure trainer is looking for you!! o goody, some more beating stuff up!!! come back next time to find out what's in store, just in time for the spooky holiday coming up! see ya in a few!